With 23 players remaining in Event #25, a $1,500 Seven-Card-Stud hi/lo tournament, it would seem that the ladies have their best chance to win their first WSOP bracelet since 2008, considering four of the remaining players are female, and three of those players are very well-known poker pros. Cyndy Violette, Karina Jett, and Kristy Gazes are all still in contention in the tournament, but the field is definitely stacked with some very experienced poker players including bracelet winner and WPT commentator Mike Sexton, 2010 WSOP POY Frank Kasella, the winner of this same tournament last year David Warga, Tony Ma, and WSOP commentator Norman Chad –Could we possibly see a Mike Sexton vs. Norman Chad heads-up match??? 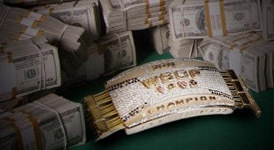 This entry was posted on Thursday, June 16th, 2011 at 11:42 am and is filed under Poker News. You can follow any responses to this entry through the RSS 2.0 feed. You can leave a response, or trackback from your own site.